A square is 9 feet long on each side. How many smaller squares, each 3 feet on a side can be cut out of the larger square? Each side can be divided into three 3-foot sections. This gives a total of squares. Another way of looking at the problem is that the total area of the large square is 81 and each smaller square has an area of 9. Dividing 81 by 9 gives the correct answer. Figure A: A square with sides of length 3 feet each. Figure B: A rectangle with length 30 inches and width 42 inches. Figure C: A rectangle with length 2 feet and width 4 feet. Figure A has area square feet. Figure C has area square feet. From least area to greatest, the figures rank C, B, A. The length of one side of a square is . What is the square's area? The area of any quadrilateral is found by multiplying the length by the width. Because a square has four equal sides, the length and width are the same. For the square in this question, the length and width are . Remember: area is always given in units2 . If a square has a side that is 3 yards long, what is the area in square feet? The area of a square is found by multiplying the length of a side by itself. If one side is 3 yards, this means one side is 9 feet since there are 3 feet in a yard. Since every side is of equal length, you would multiply 9 feet by 9 feet to find the area. This results in 81 square feet, which is the correct answer. Refer to the above diagram, which shows a square. 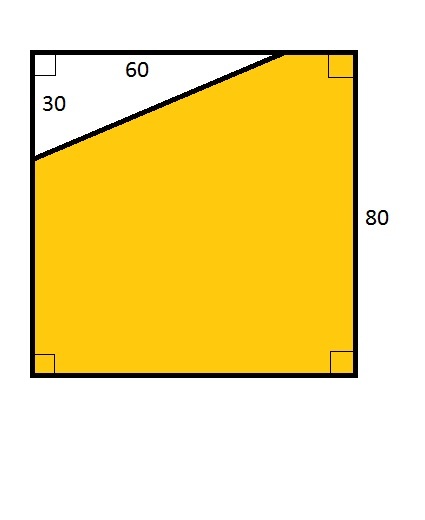 Give the ratio of the area of the yellow region to that of the white region. ; that is, 55 to 9. Find the area of a square with a width of 13cm. where l is the length and w is the width of the square. Now, we know the width of the square is 13cm. Because it is a square, all sides are equal. Therefore, the length is also 13cm. The width of a rectangle is half of its length. If the width is given as what is the perimeter of the rectangle in terms of ? The sum of the widths is and since the width is half the length, each length is . Since there are 2 lengths we get a total perimeter of . The above figure shows the size and shape of a yard that is to be surrounded by some fence. How many feet of fence will be needed? Note: all sides meet at right angles. The best way to see that 750 feet of fence are needed is to look at this augmented diagram. Note that two of the sides are extended to form a smaller rectangle whose sides can be deduced by subtraction. Since opposite sides of a rectangle are congruent, this allows us to fill in the two missing sidelengths of the original figure. The rectangle has a perimeter of 38 centimeters.